Download "DESKTOP PUBLISHING SYLLABUS Star Valley High School. 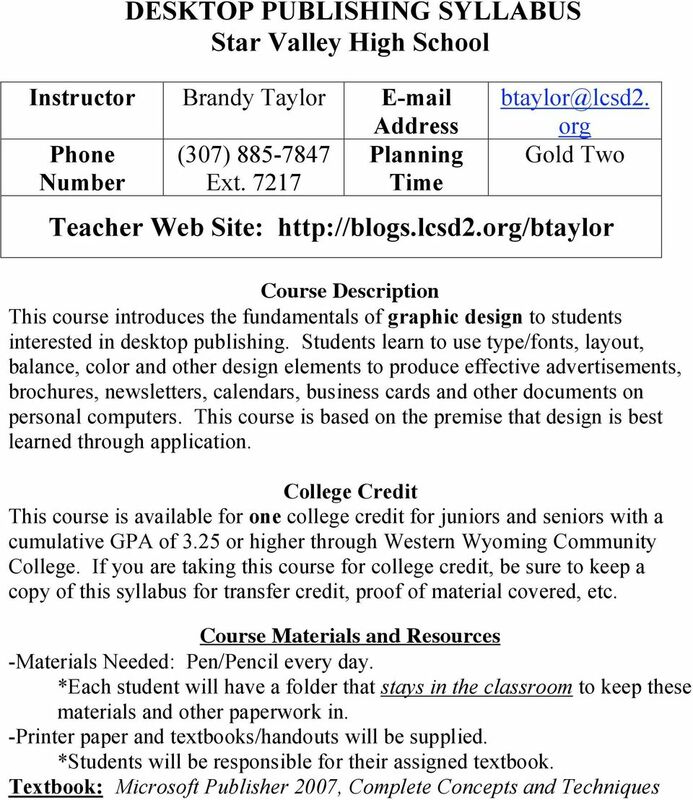 Teacher Web Site: http://blogs.lcsd2.org/btaylor"
2 Class Objectives: Learn to format documents in acceptable business styles. Prepare documents using advanced software features. Evaluate design elements in documents for appropriate use of focus, balance, proportion, contrast, directional flow, consistency, color, and page layout. Use graphics and desktop publishing features to design brochures, newsletters, flyers, calendars and other professional documents. 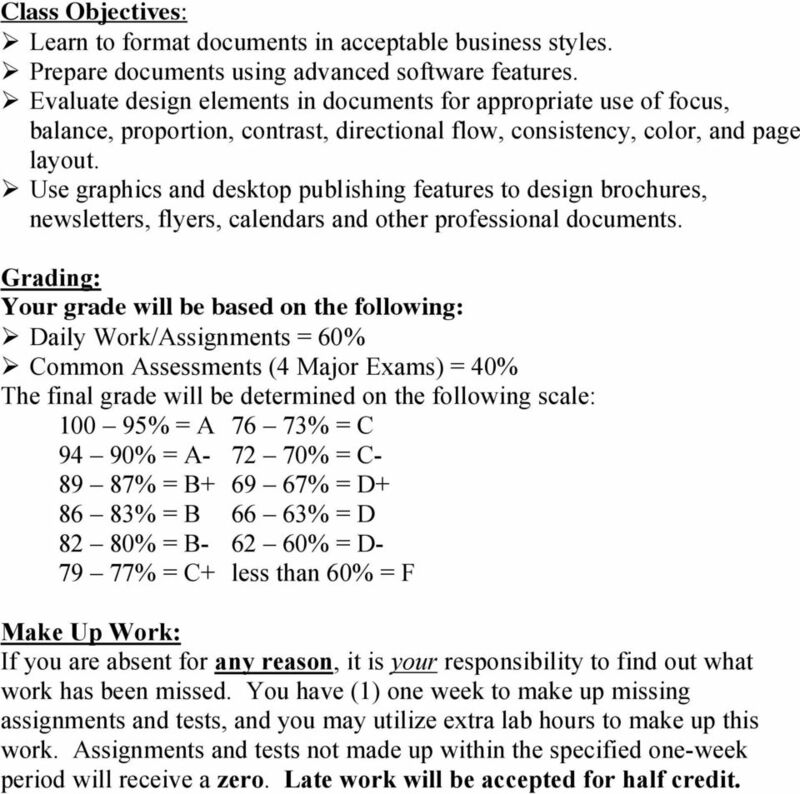 Grading: Your grade will be based on the following: Daily Work/Assignments = 60% s (4 Major Exams) = 40% The final grade will be determined on the following scale: % = A 76 73% = C 94 90% = A % = C % = B % = D % = B 66 63% = D 82 80% = B % = D % = C+ less than 60% = F Make Up Work: If you are absent for any reason, it is your responsibility to find out what work has been missed. You have (1) one week to make up missing assignments and tests, and you may utilize extra lab hours to make up this work. Assignments and tests not made up within the specified one-week period will receive a zero. Late work will be accepted for half credit. 3 Units of Study Unit Creating & Editing a Publication Designing a Newsletter Preparing a Tri-Fold Brochure for Outside Printing Personalizing & Customizing Publications w/information Sets Assessments Creating Business Forms & Tables Quiz Participation Policy Students should be in class every day. One of the most significant factors affecting school success is regular attendance. Doing make-up work, getting notes from a friend, or reading from a book can never compensate for the class experience where the teacher explains the material and the class has the opportunity for guided interaction with the concept being studied. Class Participation Includes: Listening. Being to class on time. Daily attendance. Involvement in discussion and group work. Being on task with the assigned work and completing assignments on time. Exhibiting good class behaviors. Internet, , and games only when approved by your teacher. 4 Participation Point Guidelines: Participation will be as follows: Students will be in class on time and behave appropriately. If a student is behaving inappropriately or is not on task, discipline measures will be taken. School-excused absences: the student is responsible to get the assigned work before they leave. The class work missed due to these absences will have to be made up by the student within one week from the missed day. Excused absences: the teacher will allow the student to make-up the work missed within the one week period. Unexcused absences: the student will not be allowed to make up the work missed. A student is tardy if he/she is not in the room when the bell rings. 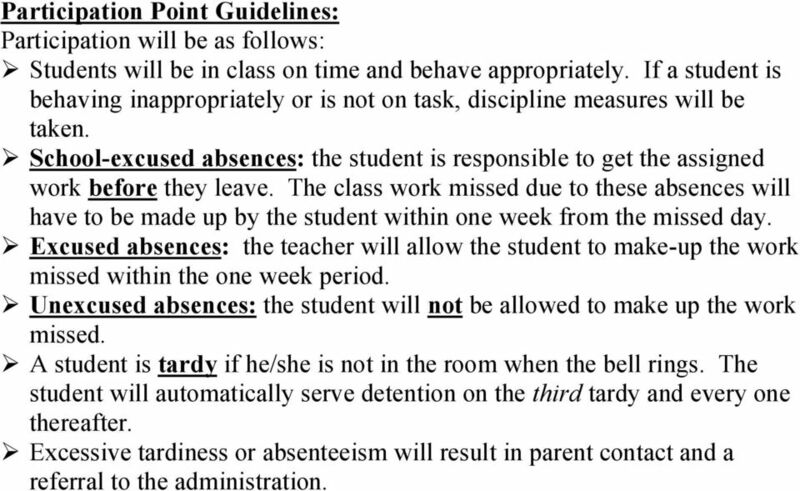 The student will automatically serve detention on the third tardy and every one thereafter. Excessive tardiness or absenteeism will result in parent contact and a referral to the administration. 5 Classroom Rules No cell phones! Turn them off or don t bring them at all. If it is heard in class, I will take it and you can pick it up at the office at the end of the day! 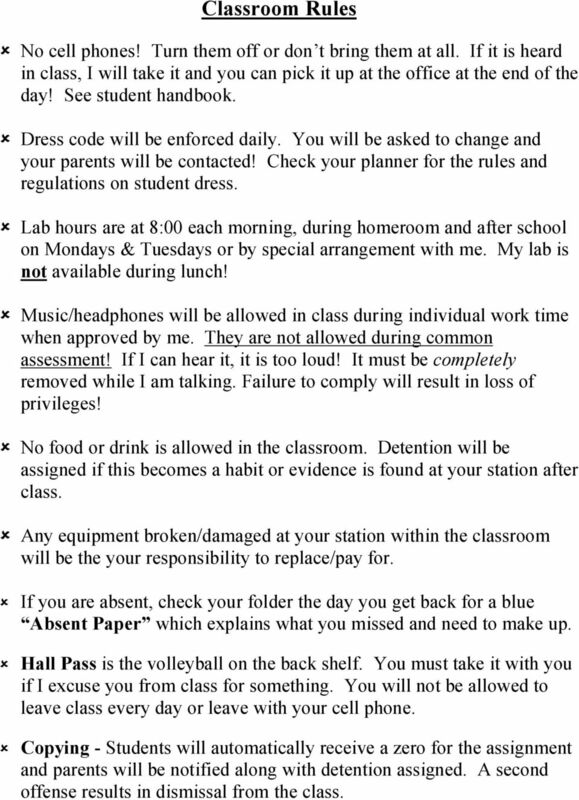 See student handbook. Dress code will be enforced daily. You will be asked to change and your parents will be contacted! Check your planner for the rules and regulations on student dress. Lab hours are at 8:00 each morning, during homeroom and after school on Mondays & Tuesdays or by special arrangement with me. My lab is not available during lunch! Music/headphones will be allowed in class during individual work time when approved by me. They are not allowed during common assessment! If I can hear it, it is too loud! It must be completely removed while I am talking. Failure to comply will result in loss of privileges! No food or drink is allowed in the classroom. Detention will be assigned if this becomes a habit or evidence is found at your station after class. Any equipment broken/damaged at your station within the classroom will be the your responsibility to replace/pay for. If you are absent, check your folder the day you get back for a blue Absent Paper which explains what you missed and need to make up. Hall Pass is the volleyball on the back shelf. You must take it with you if I excuse you from class for something. You will not be allowed to leave class every day or leave with your cell phone. Copying - Students will automatically receive a zero for the assignment and parents will be notified along with detention assigned. A second offense results in dismissal from the class. 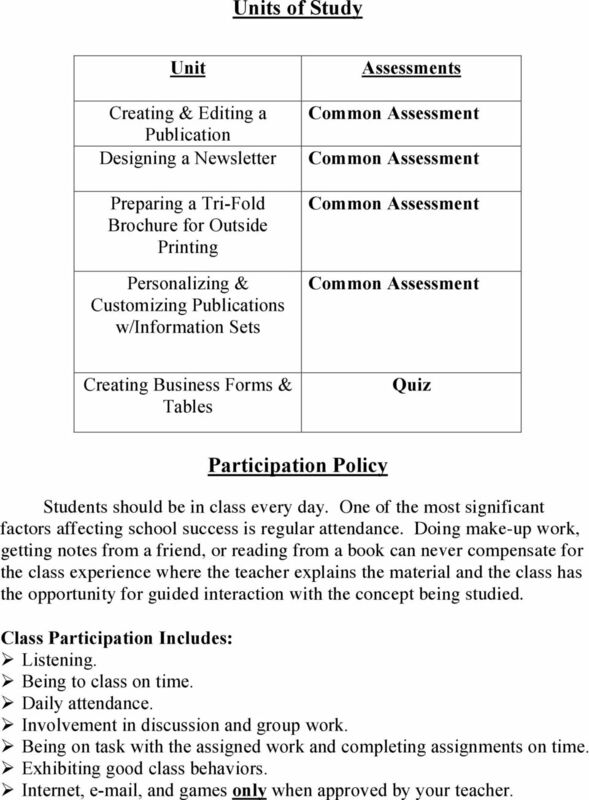 6 DESKTOP PUBLISHING Student and Parent Signature I have read all of the above material and understand what is expected of me as a student in this class. Student I have read the syllabus and understand what is expected of me as a student in this class. 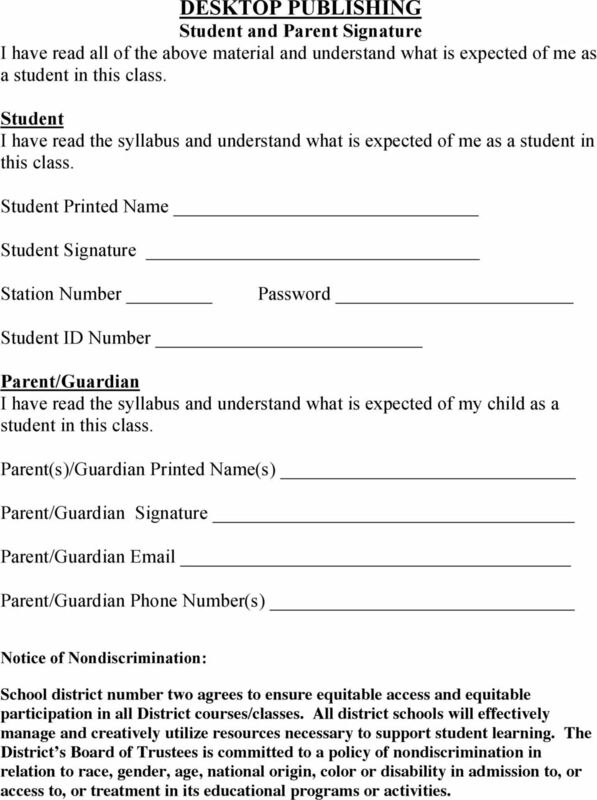 Student Printed Name Student Signature Station Number Password Student ID Number Parent/Guardian I have read the syllabus and understand what is expected of my child as a student in this class. Parent(s)/Guardian Printed Name(s) Parent/Guardian Signature Parent/Guardian Parent/Guardian Phone Number(s) Notice of Nondiscrimination: School district number two agrees to ensure equitable access and equitable participation in all District courses/classes. All district schools will effectively manage and creatively utilize resources necessary to support student learning. The District s Board of Trustees is committed to a policy of nondiscrimination in relation to race, gender, age, national origin, color or disability in admission to, or access to, or treatment in its educational programs or activities.